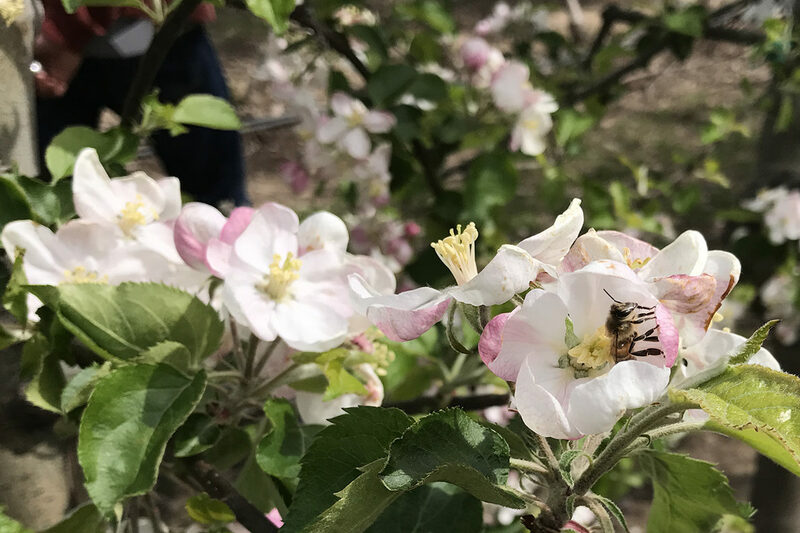 Bees pollinate apple blossoms at the WSU Sunrise Research Orchard near Wenatchee. A WSU-led team is developing a precision pollinator model for the university's Decision Aid System, helping growers grow crops more efficiently (Photo by Peter Shearer-WSU). WENATCHEE, Wash. – Apple growers depend on the honey bee to pollinate their crops, but there’s a delicate, challenging balance between hives, flowers, fruit and weather that can be difficult for even the most skilled growers to navigate. Now, WSU researchers are helping improve the odds with the development of a precision pollination model and data-driven decision-support tool. Bees fertilize apples by flying from flower to flower, feeding and distributing pollen. If bees don’t pollinate enough flowers, growers are left with a miniscule crop, but too many bee visits bring the added cost of thinning or removing small, undeveloped fruit. Throw in the vagaries of weather, climate and changing apple varieties, and it’s more challenging than ever for growers to achieve perfect pollination. In a three-year, $303,000 project funded by the Washington Tree Fruit Research Commission, a team of WSU researchers led by Jones is building a precision pollination model and decision-support tool to help growers efficiently pollinate their orchards. The new model, being tested now by Northwest growers, will help Washington’s $2.4 billion apple industry be more competitive and sustainable, ultimately ensuring the supply of fruit we love. His model incorporates many variables, from honeybee foraging patterns to sun, rain, wind and cloud cover and the flower behavior of the latest apple varieties. Growers thin blossoms or fruit by chemical means, mechanically, or by hand. That can get expensive — upwards of $1,000 per acre by hand — prohibitively so for large orchards. 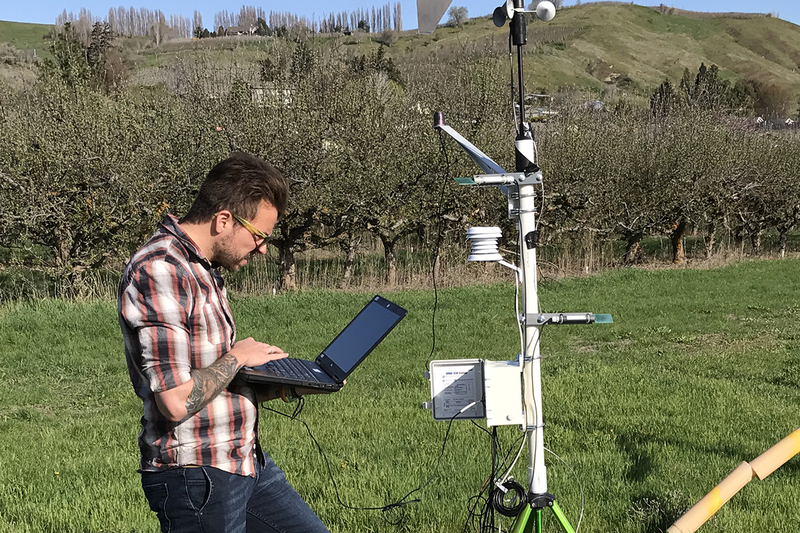 Helping generate a new data model of pollination in fruit tree crops, WSU graduate intern Julián Andrés Valencia Arbeláez collects weather data with a portable station at WSU’s Tree Fruit Research and Extension Center in Wenatchee. (Photo by Peter Shearer-WSU). Jones and his colleagues designed the new model to help growers see when blossoming will occur and predict the quality of bee foraging in their local area. It will help growers decide when to leave the hives in their orchards a bit longer to ensure a good crop, or take them out to cut down on thinning, reducing fuel consumption and use of chemical sprays. Working at WSU experimental stations, and alongside growers in Washington orchards, team members are collecting data on bee activity, blossom timing and fruit set — the process in which flowers become fruit and mature fruit size is determined. That includes data on modern apple varieties, including WA38, the Cosmic Crisp apple, which is being planted by the millions. Researchers also are studying how climate change may affect timing and quality of pollination. When finished in 2020, the model will be part of WSU’s Decision Aid System (DAS), an important tool used by growers in the United States and Canada. As it is finished and validated, the model will join others on honeybee foraging and flowering times, already available on DAS for several cultivars. While apples are the main focus of the new model, researchers are adding data for cherries and pears, and it could be applied to nearly any pollinated crop.